*serves 670 culturally and economically diverse students. *houses an on-site after school care program. *supports Young Inventors, Name That Book, UIL Chess and Odyssey of the Mind. *values rich traditions and alumni. River Oaks Elementary School develops extraordinary learners through a program of differentiated, rigorous inquiry so that they may innovate and collaborate in a global society. The International Baccalaureate Primary Years Programme provides our framework for the development of internationally-minded learners that embody the ten attributes of the IB learner profile…inquirers, knowledgeable, thinkers,communicators, principled, open-minded, caring, risk-takers, balanced, and reflective. All learners have the right to develop their gifts and talents. All learners benefit from project-based learning that fosters creativity and innovation. All learners deserve enrichment opportunities that stimulate intellectual, physical, and creative growth. All stakeholders (learners, staff, parents,and community members) play a vital role in the success of our school and thrive in a culture of mutual respect. ROE FAMILY HANDBOOK FOR ALL PARENTS - Please view the ROE Family Handbook for school information on arrival, dismissal and all other operational policies and procedures by clicking here. 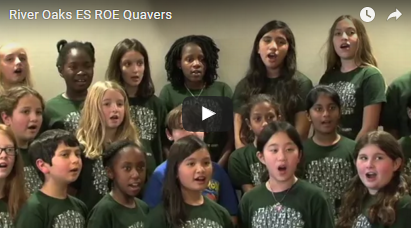 The River Oaks Elementary School Quavers perform at the Hattie Mae White Educational Support Center.